The FB-236-SQ is constructed from choice Appalachian Hardwood with an elegant Queen Anne Cherry finish, gold accent trim, sturdy masonite backing, and 1/8" glass front. The FB-236-SQ is constructed from choice Appalachian Hardwood with an elegant Queen Anne Cherry finish, gold accent trim, sturdy masonite backing, and 1/8" glass front. A silk-screened, paper, flag front is included for display. The depth between the glass and masonite is 2 3/8". FB-236-SQ. 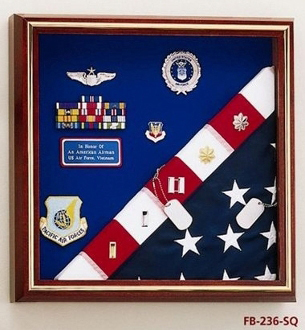 Overall size: 17 1/2" W x 17 1/2" H x 3" D. Inside (face) area: 15 1/2" W x 15 1/2" H x 2 3/8" D. In addition to honoring our Veterans, this piece is also ideal for display of baby items, wedding momentos, graduation keepsakes . . . the possiblities are endless! Color choice of velour: Black, Burgundy, Gray, Green, Red, Navy Blue, or Royal Blue. Velcro-compatible material available for an additional charge: Black, Burgundy, Camel, Gray, Green, Oyster, Red, or Royal Blue. Wall-mountable only. Keyholed, ready to hang.